Her golden jewels are shining, She’s combing her golden hair. I am delighted to invite you on a cruise up the Rhine with a few of our friends, my husband and me. We will sail with AmaWaterways on November 9 this year from Amsterdam, up the Rhine to Basel, Switzerland. George and I have been along this path before and truly enjoyed it. We are looking forward to seeing the sights again, with crisp autumn air and harvest foliage in the hillside vineyards. This map shows our itinerary for the Enchanting Rhine cruise. In case you haven’t been on a river cruise before this is what you can expect. The ship stops each day in a city or village for touring which is included in your fare. Usually there are walking tours of the historic city centers or other locations of note. 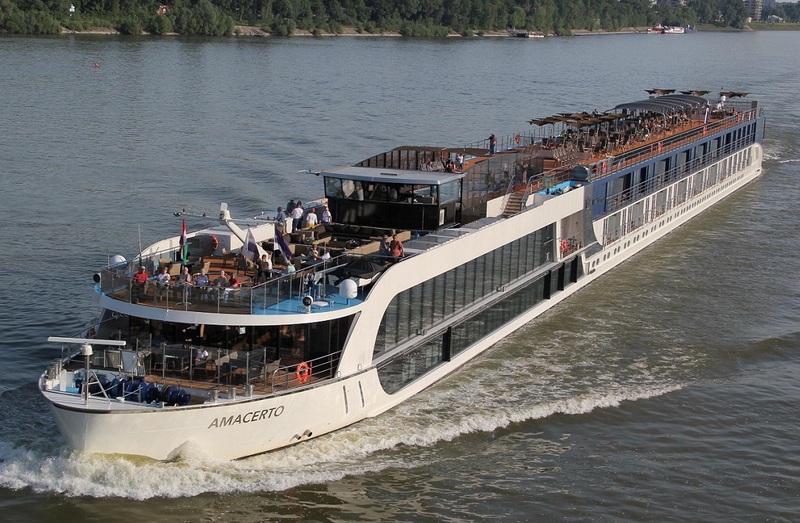 With AmaWaterways the tours are offered at three energy levels. The slow walkers like me do not feel rushed at the leisurely pace, and the high energy touring groups hustle on ahead without the temptation to grumble about the turtles slowing everyone down. (The medium group suits those in the mid-range.) In many ports AmaWaterways offers biking tours, too, using the bikes they carry on the ship. The included half-day tours are valuable orientation and introduction to the highlights of each port. The remainder of the day is free for exploring on your own. Often there is an additional tour during the remaining time, for an extended visit to a castle, vineyard or city further afield; there is a charge for these additional tours. The cabins on the AmaCerto (“our” ship) are among the most spacious on the rivers of Europe. Most cabins have a combination French balcony (for waving but not for standing outside) and an outside balcony with room for chairs. Television, Wi-Fi and computer keyboard are a combined unit in every cabin. Bathrooms are bright and spacious. AmaWaterways cuisine is prepared by chefs trained to the standards of La Chaine des Rotisseurs. Menus often include local flavors and specialties of the region visited during the week. Carefully selected wine, often local, is included with meals at no additional charge. 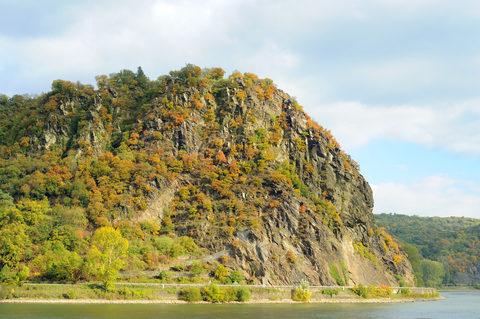 passing the famous Lorelei rock. If you did not study German in high school, you might not know the story of the siren Lorelei who sat at the top of the rock, combing her golden hair with a golden comb. Without meaning to, I am sure, the Lorelei distracted the sailors passing through the treacherous tight bends and rapids below, causing the shipwrecks that plague the channel. Heinrich Heine told the story in a poem which has been set to music several times and inspired references in comic books, pop records, and classical music. You can hear the best known melody here. Ever since Frau Johnson told us the story, I have looked forward to gazing on the rock myself. I have every confidence that the crew are experienced sailors who keep their eyes on the currents rather than the Lorelei seat! If you want to see Amsterdam, the Rhine, Cologne, Strasbourg, points in between, and go on to Switzerland, please join us. AwaWaterways has put this and several other departures on sale now, saving you $1500 per cabin. I will be happy to quote prices to you while space remains. You can read all about the cruise at AmaWaterways. This entry was posted in Travel, Uncategorized and tagged AmaCerto, AmaWaterways, Cologne, Lorelei, Rhine, river cruise, Strasbourg, travel. Bookmark the permalink.